PKCs localize to distinct intracellular sites via interactions with scaffolding proteins. The PKC-anchoring protein that has received most attention is the family of membrane-associated Receptors for Activated C Kinase (RACKs), molecular scaffolds that localize individual PKCs to distinct membrane microdomains in close proximity with their allosteric activators and unique intracellular substrates. RACK proteins share a seven-WD40-motif repeat structure, similar to the protein-protein-binding motifs found in heterotrimeric G-protein P subunits. To date, proteins with characteristics of RACKs (i.e. proteins that selectively/saturably bind only the active conformation of the cognate PKC isoform and recruit the enzyme in an active conformation to a specific membrane compartment) have been identified for PKCP (RACK1) and PKCe (RACK2 or P'-COP; Mackay and Mochly-Rosen 2001; Schechtman and Mochly-Rosen 2001; Csukai et al. 1997). 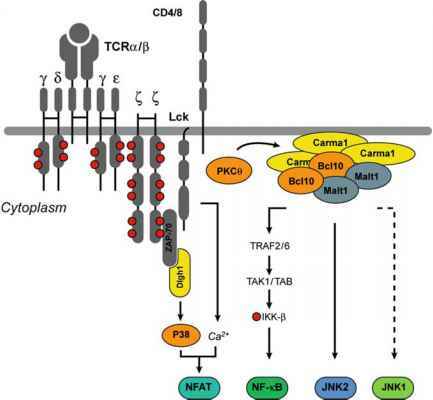 While PKCS-binding proteins have been identified, the identity of the bona fide PKC5 RACK remains uncertain (Robles-Flores et al. 2002; Kheifets et al. 2006). inhibitory (yRACK sequence-RACK-binding site) intramolecular interactions, and destabilize the inactive "closed" conformation of the enzyme (i.e. act as allosteric PKC activators). Modulators of PKC translocation based upon PKC interactions with RACK scaffolds have been developed and offer certain theoretical advantages to the use of PKC overexpression strategies (that disturb the natural stoichiometry of a given PKC isoform to its upstream activators or downstream substrates) or conventional PKC activity inhibitors (which generally lack isoform specificity). However, there is ample evidence that PKCs interact with other anchoring proteins (such as AKAPs, caveolins, and various cytoskeletal proteins, see below) that are shown not be influenced by RACK-based translocation inhibitor peptides. Moreover, it is important to note that RACK functions are not limited to the control of PKC. Rather, RACK proteins have been implicated as scaffolds that organize signaling complexes involving Src family kinases, heterotrimeric G protein Py subunits, dynamin, integrins, STAT1, the receptor protein tyrosine phosphatase PTP^, and PDE4D5 (McCahill et al. 2002). The notion that peptides designed to modulate PKC-RACK binding may exert "off-target" actions on other RACK-based signaling pathways generally also is not considered. Other true scaffolds that anchor PKC include AKAPs (which are discussed in the previous section) and caveolins. Caveolins are a family of three related isoforms that drive formation of caveolae, sphingolipid-/cholesterol-enriched buoyant detergent-resistant membranes that form flask-like invaginations of the plasma membrane. These morphologically distinct membrane structures (which biochemically resemble lipid rafts) form platforms that concentrate signaling complexes and play an important role in signal transduction pathways (note: the precise relationship between lipid rafts and caveolae remains the focus of considerable controversy; details are discussed by Patel et al. in a separate chapter in this volume). Caveolin-1 and the muscle-specific caveolin-3 (but not caveolin-2) are reported to physically interact with PKCa, PKCy, and PKCZ (but not PKCe; Oka et al. 1997; Lin, Zhou et al. 2003), and there is evidence that caveolin-1 binding decreases PKCa and PKCZ activity. Caveolin-PKC interactions have been mapped to the caveolin scaffolding domain (a short membrane proximal region of the caveolin amino terminus that serves as a protein docking motif) and a caveolin interacting motif (yXyXXXXy or yXXXXyXXy, where ^ is a hydrophobic residue) found at similar locations in the kinase domains of PKCa and PKCZ. These results have been taken as evidence that caveolin-bound PKC represents a pool of membrane-associated enzyme that is inhibited at rest and is poised for activation (Oka et al. 1997). However, a role for caveolin proteins as scaffolds or regulators of PKC isoforms in caveolae membranes has never been directly established (and other mechanisms that might anchor/regulate PKCs at this destination also have been considered). cPKCs and nPKCs are recovered at rest or following agonist-activation in the caveolae fraction of several cell types (Muller et al. 1995). We previously demonstrated that caveolae isolated from resting neonatal rat cardiomyocytes contain little to no phorbol ester-sensitive PKC isoforms and that PKCa, PKC5, and PKCe accumulate in cardiomyocyte caveolae in response to PMA (Rybin et al. 1999). Finally, there is evidence that PKC localization is influenced by cytoskeletal and structural proteins. Several laboratories have reported that PKCe localizes to sarcomeric Z-discs, but the role of P'-COP as a Z disc scaffold is uncertain, since P'-COP has been characterized as a RACK that anchors activated PKCe to the Golgi in cardiomyocytes (Csukai et al. 1997). While mutagenesis studies map Z line binding to the PKCe-V1 domain (a region of PKCe that contains the RACK-binding site), more detailed studies suggest that PKCe anchors to Z lines via a mechanism that requires multiple points of contact (which is not necessarily restricted to the RACK-binding motif and may require both protein-protein and protein-lipid interactions, Robia et al. 2005). In this context, it is important to note that other components of the Z-disc with PKC-binding activity have been identified. Cypher is a striated muscle-specific protein with an N-terminal PDZ domain that interacts with a-actinin and a LIM-domain that binds PKCs (Zhou et al. 1999). CapZ is a capping protein that binds and anchors the barbed-end actin filaments. There is evidence that CapZ (rather than RACK1) targets PKCPII to the myofila-ments and plays a key role in the transduction of PKC-dependent signals at Z-discs (Pyle et al. 2006); transgenic mice with decreased CapZ protein expression exhibit increased myofilament calcium sensitivity, a defect in PKC binding to cardiac myofilaments, and impaired PKC-dependent regulation of myofilament function (Pyle et al. 2002). Finally, actin (a sarcomeric protein that also constitutes a major component of the cytoskeletal network of non-muscle cells) interacts with a con-formationally hidden actin-binding motif that lies in the PKC-e regulatory region, between the two cysteine-rich C1 domain DAG/PMA binding sites. This region is exposed upon PKCe activation, leading to a PKCe-actin binding (an interaction that stabilizes PKCe in a catalytically active conformation, Prekeris et al. 1996).